The large, powerful and unmistakably Italian voice of this young master violin by Cristiano Ferrazzi and the beautiful grain of its tone woods clearly demonstrate that the contemporary liutaio from the musical city of Verona certainly ranks amongst the most captivating luthiers of our time. Cristiano Ferrazzi initially began his training with Bruno Montagne and Guy Coquoz, two excellent ambassadors of their craft whose workshops each merge the lines of major European violin making traditions. Both of Cristiano Ferrazzi’s teachers represent a generation of the Cremonese school which was trained to the highest standards under Gio Batta Morassi and Francesco Bissolotti. Whereas Montagne later pursued the Italian tradition of his craft at greater depth under Mario Gadda, Coquoz found himself moving from his native Switzerland to Paris, where he dedicated himself to his twin passions: Baroque violin making and excellent, innovative contemporary work. 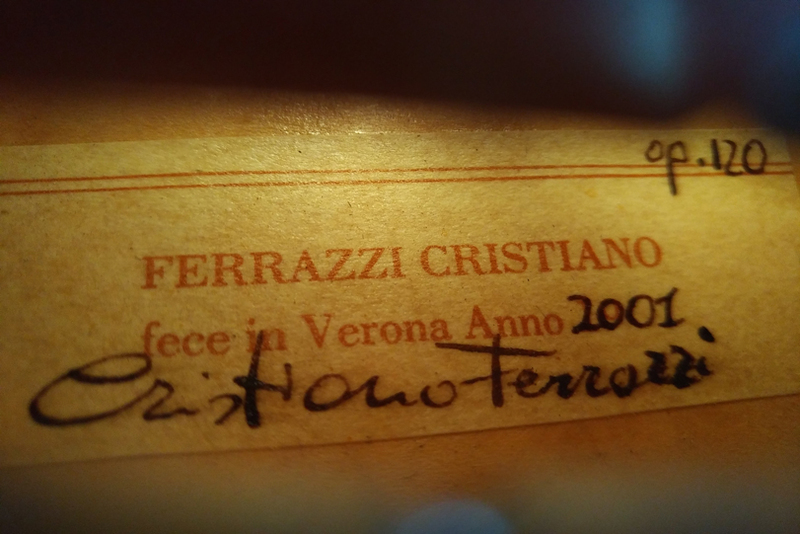 It is within this broadly defined horizon that Cristiano Ferrazzi took his first steps before going to Cremona himself in the 1980s, following in his teachers’ footsteps. There he first completed regular training at the famous violin making school, and subsequently he matured into a young master with multi-facetted training under Morassi and Giovanni Lucchi. In 1989 he even won the third price at the highly regarded national violin making competition in Baveno. This rich interplay of influences which shaped Ferrazzi from the first day of his career onward is particularly well expressed in this violin that was played for years by a professional musician; it was perfectly complemented by the bow it was played with, a gold-mounted masterpiece by Johannes S. Finkel, the great Saxonian-Swiss bow maker and the teacher of Cristiano Ferrazzi’s own teacher, Giovanni Lucchi. In this context, it comes as no surprise whatever that this violin reflects perfect artisanal quality and a sophisticated, self-confident style. Inspired by the tastes of the finest Italian virtuoso masters, Ferrazzi showcases the exceptionally beautiful fluid flames of the rare maple used for the one-piece back of this masterful Guarneri interpretation: rather than working around two knots in the wood, he integrates them into the design. The manner in which he accentuated the moderately grained spruce of the top is equally striking, with a dark-brown oil varnish enhancing the wood’s delicate structure and with subtle natural crackling as a crowning touch. A noteworthy example of Cristiano Ferrazzi’s woodworking skill is visible in the harmonious proportions of the impressive, deeply carved scroll. Multiple brand marks and an original label confirm the authenticity of this violin, which was made in 2001 as op. 120 and ranks amongst Cristiano Ferrazzi’s more mature pieces. After having been carefully examined and set up by our luthiers, the instrument is now in magnificent condition and ready to play. Ferrazzi successfully created a modern contemporary interpretation of the legendary and powerful Guarneri sound, and its flawlessly balanced radiant character will satisfy the highest standards.